The City of Winter Haven received an average of 3.39 inches of rainfall during the first month of 2019. 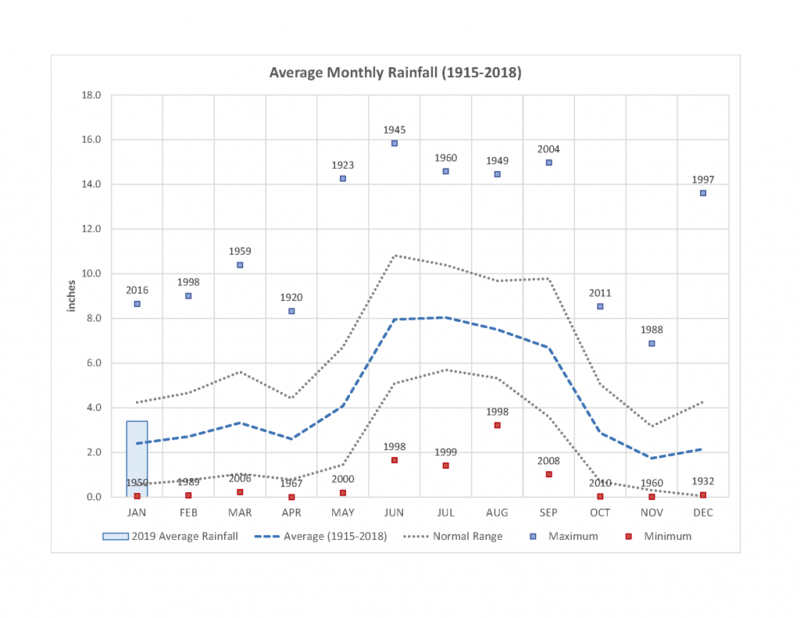 Since hydrologic impacts don’t reset with the start of each year, it is important to consider historic conditions as they relate to what we’re seeing this year. 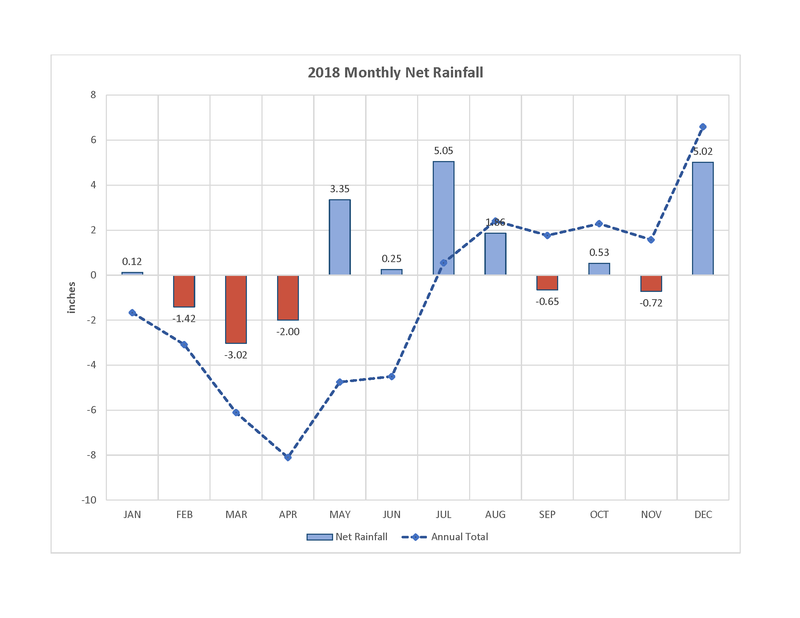 Figure 1 illustrates how January’s rainfall total was somewhat above the long-term average of 2.4 inches. While this can be considered a continuation of wet conditions carrying over from December of 2018, this month’s precipitation is still within the normal range. Due to City’s location at the top of a ridge, we’re considered a rainfall-driven system–meaning all water entering the area originates from precipitation, as opposed to streamflow. Determining the net gain of water is important to understand whether our water supply has increased or decreased. One of the main avenues for water loss to the area is via evaporation and transpiration which are referred to collectively as evapotranspiration. Due to the wet conditions in 2017, the City received more water than it lost with a final total of 6.59 inches for the year (Figure 2). 2019 continues this trend with a net gain of 1.62 inches for the month of January. As was mentioned above, the gain or loss of water via precipitation impacts multiple factors such as lake surface levels and groundwater recharge. 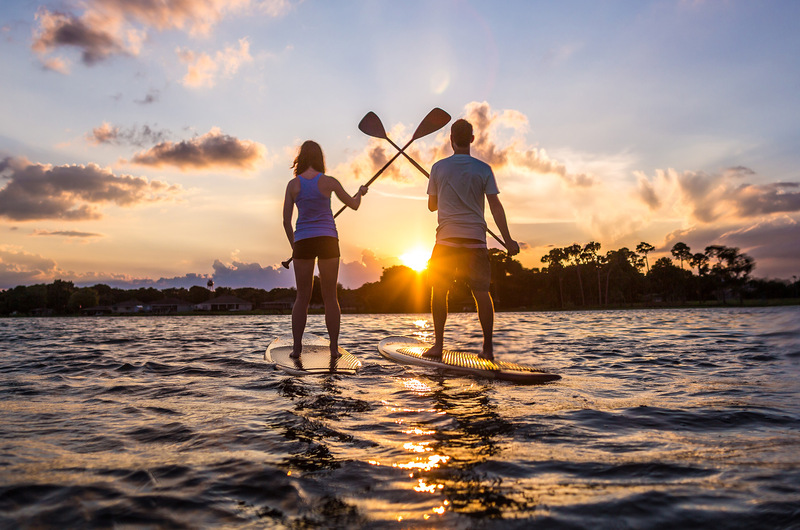 The lakes in this town are such an integral component that Winter Haven was dubbed the Chain of Lakes City. By virtue of this, monitoring lake surface levels can provide insights into their overall health. Components like water quality, navigability, and wetland habitat are often directly related to surface level. The net gain in rainfall has allowed Winter Haven’s lakes to remain high. 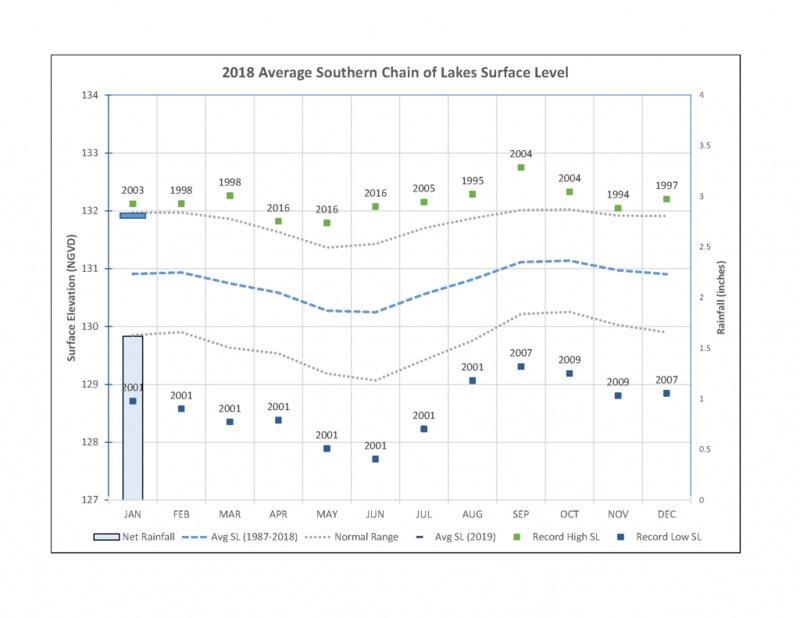 The current monthly average surface level for the Southern Chain sits at 131.9 ft which is actually a slight increase since December (131.56 ft). This slight increase was predicted in last month’s report. As seen in Figure 3, the Southern Chain remains at above average levels–situated right at the top of the normal range. What this means for the Chain is generally good news. The wetlands surrounds some of our lakes have the capacity to filter excess nutrients and pollutants from the water when levels are high. In addition, holding more water in these lakes allows for more potential groundwater recharge. The Upper Floridan Aquifer (UFA) is the source of Winter Haven’s municipal water supply. The level of this aquifer also impacts and is impacted by other hydrologic components such as lake levels and rainfall. The UFA under the City is monitored via a SWFWMD well located downtown. Though the actual position of the aquifer differs based on topography and underlying geology, this monitoring site is a good reference point. 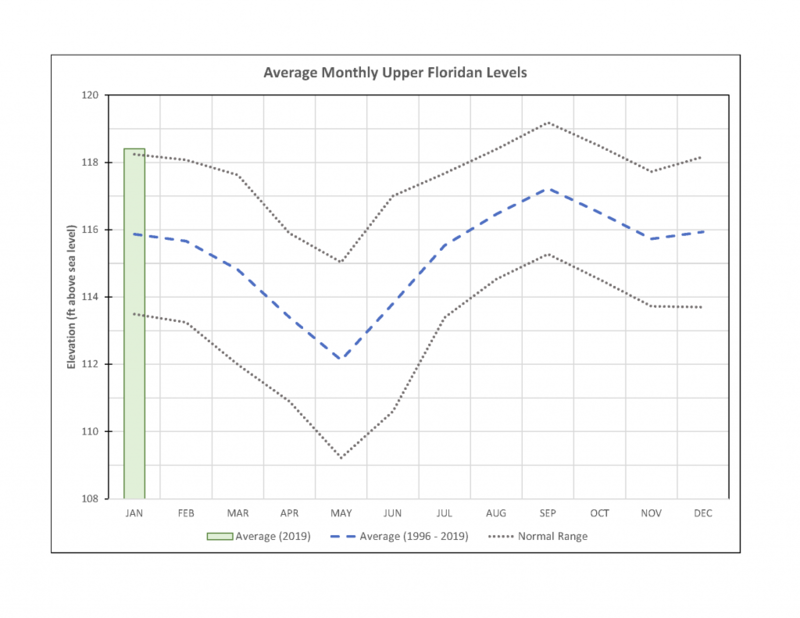 The average UFA level increased from 118 ft in December to 118.4 ft in January–an uncommon occurrence during Florida’s dry season. As predicted, the considerable rainfall in December has allowed for increased recharge of our drinking water source. Figure 4 shows that the current level continues to sit well above the historic average and normal range for this time of year.